Question: What are the top news results when you do an online search for “Carnegie Fellowship”? Answer: At least 15 stories published by institutions affiliated with one of the 31 scholars named in Carnegie Corporation of New York’s 2018 announcement. Thanks go to our friends — the communications teams with peer and affinity groups who share a compelling interest in promoting the Andrew Carnegie Fellows Program to their influential niche audiences. Leveraging relationships offers tremendous potential for public relations synergy because it’s relatively straightforward, it’s low-cost, and it’s easy to replicate. We will always value placements with news media, but for some initiatives, we get the best from focusing on our natural networks, creating a win-win scenario. We all share a vested interest in spreading the good news about the Andrew Carnegie Fellows — while simultaneously underscoring the importance of philanthropic support for research in the humanities and social sciences. Identify affinity groups and the appropriate point persons for communications about the announcement. We ask the Carnegie fellows to help supply this information, and for this roll-out we mostly contacted universities. Send an explainer email to each communications team at least a week in advance of the public announcement with embargoed information about the winning scholar, the program, and our overall communications plan. Ask each institution to spread the word via a website story about the scholar and the winning proposal, as well as through social media, e-newsletters, and wider media outreach. Provide a communications toolkit — a “one-stop” source for information such as the embargoed news release, a narrative about the award, a fact sheet, sample social media messages and artwork, a hashtag, and a designated URL for online information. Notify the fellows to tell them about the communications efforts and request their (optional) participation. Provide the fellows with sample social media messages and artwork. 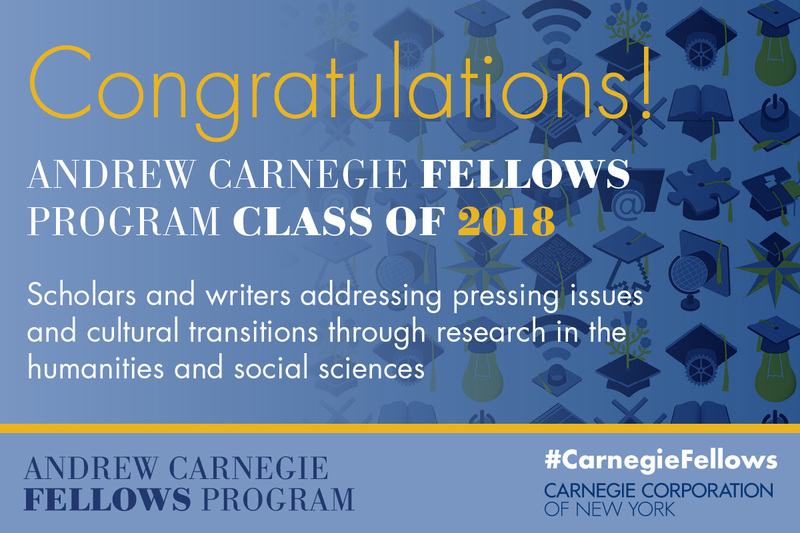 Alert past fellowship recipients to ask them to consider posting a few words of congratulations to the new class of Carnegie fellows. Provide past fellows with sample social media messages and artwork. We emphasize the embargo, and through our combined efforts we succeed in maximizing the promotional push on the day of the announcement. I also email a range of potential “friends,” including: news publications in the markets where the scholars are located; niche publications and organizations dedicated to subjects such as higher education and philanthropy (not least our friends at Philanthropy New York); and membership organizations dedicated to the humanities and social sciences. Some additional steps: the Corporation sends out an e-newsletter; instead of spending money on a costly news release service, we invest in print and digital ads; and we promote posts on social media. We are four years into the Andrew Carnegie Fellows Program, and we are gaining traction: unique page views about the announcement on our website doubled year over year. Twitter posts that utilized #CarnegieFellows jumped 50% during the same period. It’s gratifying to see what you can do with a little help from your friends.